The UK & Ireland Open Tree Climbing Competition (UK&ITCC) under ISA rules attracts some of the finest tree climbers to compete in a wide range of activities culminating in the Masters’ Challenge. Three time World Tree Climbing Champion Jo Hedger won her first UK&ITCC title in 2009 and went on to claim the title for nine consecutive years, this year she’s going for an incredible, and possibly unbeatable, tenth victory on the trot. Competing against legendary climbers may seem a bit intimidating at first, but the part of the beauty of the UK&ITCC is that you can climb with high calibre competitors and learn great tips from them and pick up priceless experiences. “I’m so pleased I entered my first tree climbing competition 12 years ago, I’ve learnt so much since then and improved my climbing knowledge; it helps me every day at work. Also, the people I have met and gained friendships all over the world is priceless to me. “It’s a friendly environment; if you’re struggling with your climb people will help you, give you tips and make you feel comfortable. It’s about getting together and having fun climbing trees. The 2018 overall winners Jo and Michael Curwen went on to represent the UK and Ireland in the 2018 European competition, they were joined by Graham Bird and Tadhg Leahy who finished second and third respectively. The UK & Ireland Climbing Competition has been running since 1995 as part of a global series that provides competitive and educational opportunities for working arborists to demonstrate and exchange new climbing techniques, increase industry interaction and provide positive public exposure for the profession. The highest placed finishers qualify for the following years’ European Tree Climbing Championships in Germany and are also eligible for the International Tree Climbing Championship. 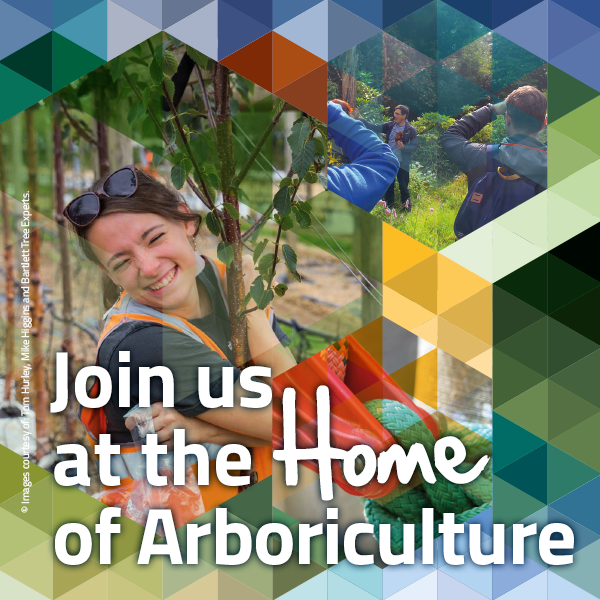 This competition, which complements the 3ATC UK Open held at the ARB Show and 3ATC College contests, aims to simulate the working conditions of arborists in the field. Climbers perform five different events during preliminary rounds which take part on Saturday (ascent, throwline, aerial rescue, work climb and speed climb). Each event tests their ability to manoeuvre professionally and safely in the tree while performing work-related tree-care tasks. First up it’s the ‘Ascent’ event which tests your ability to use an approved ascent system efficiently and safely. This challenge assesses the competitor’s proficiency in attaching the ascent system to the ascent line, ascending to the bell, and transferring into a descent system. Points are earned for speed as well as for meeting predetermined safety objectives. Then the timed ‘Throwline’ event tests your accuracy in placing a throwline and/or climbing line in a tree at heights between 10m and 20m. The aerial rescue is also timed and tests competitor’s ability to climb to and safely lower a climber who is unable to descend without assistance. Climbers perform a risk assessment, a pre-climb assessment and an onsite casualty assessment, and should use all relevant techniques to ensure that the rescue process does not exacerbate the pre-decided injury. The ‘Work Climb’ tests your skill and manoeuvrability around the tree using a climbing system. Starting from a staging area in the tree you visit five work stations throughout the tree, performing a specified task at each station within 5 minutes. For the ‘Speed Climb’ challenge competitors climb a predetermined route from the ground to 18m up a tree with a belayed climbing system for safety. The event is timed, and the competitor who reaches and rings the final bell of the course in the quickest time wins. Scores from each preliminary event are totalled, with the top-placed competitors qualifying to compete in the Masters’ Challenge on Sunday. The Masters’ is the final round of the competition where the top men and top women finishers from the preliminaries advance to the Masters’ Challenge to compete for the title. The Masters’ Challenge is designed to test the competitors’ overall productivity and skill. Competitors are judged and scored on their knowledge and their ability to demonstrate mastery of different climbing techniques, use of equipment, poise in the tree and safe working practice. Alongside the great atmosphere, a shot at the title and entry into the European and International championships; there are some great prizes on offer with support from overall sponsor Husqvarna UK, Preliminary events sponsor Haecksler Woodchippers and £500 worth of Marlow ropes to name a few. Don’t feel you’re ready for the competition yet? Don’t worry, you can still get involved and get a great feel for the event or meet climbers and likeminded arborists by coming along and cheering on the competitors. Sunday morning also features a series of educational events which you can enjoy alongside our climbers before they compete in Masters’ Challenge in the afternoon. Spectators are more than welcome to attend from within the industry or beyond. “I was given loads of useful advice, I learned a tonne of new techniques, and I witnessed loads of new equipment in action. All three of us came away from it with a renewed passion for our vocation and will definitely be back for future events. “Exeter University has great facilities, and beautiful trees for us to climb. We had a good mixture of climbers, from complete novices to experts. Every single person showed their own abilities and learnt new skills. We had a great turnout of volunteers, and without them the event would not happen. This year the Arboricultural Association is holding the 1st ever Student Arboriculture Conference at Merrist Wood College. Tickets are free on the Friday and only £10 for non student members on Saturday.